In response to Moses’ objections, God has one simple yet profound question: “What is in your hand?” It is a fascinating question to ponder. Have you ever noticed how often leaders in today’s church often reverse the question, unwittingly taking God out of the equation? It is certainly more realistic and rational to ask “what is in other people’s hands,(? )” especially when our hands look and feel so empty in comparison – we lack resources, people, specific gifts, special talents, money, superior intellect, and … well, you name it. God is still in the business of calling his people to what may seem like an impossible mission. But before we get lost in our own list of objections, perhaps we, like Moses, should answer the next question: What in our hand? In other words, what resources do we already have that are being underutilized? What people are in our midst that might just be waiting for an invitation to join hands in ministry in a new way? What seemingly ordinary things do we carry around every day that God is just waiting for us to surrender to his will, his power, and his mission of deliverance and salvation to those who are oppressed? Moses answered God’s question with what would seem a joke to anyone else. What was in his hand? That part was obvious. 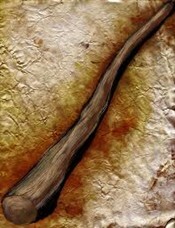 A stick. A dead piece of wood. A simple, ordinary, everyday staff. They were a dime a dozen. Who didn’t have one? Could anything be more unimpressive? Yet it was this simple object that would teach Moses one of the most important biblical lessons of mission and ministry. It is a lesson that today’s church dare not forget. Let us refuse to shirk the call of God out of fear, self-doubt, or feelings of inadequacy that often come when we compare ourselves to others. Let’s just give God what we have – what is in our hand – whatever it is, no matter how small or insignificant it might seem. We, like Moses, may be surprised at what God does next!